I had just completed my initial days of shadowing and observing the five students I'd been assigned to as an Academic Coach at my local elementary school, and I was beginning the weekly one-on-one sessions with the kids. I had been trained in the intervention program Check & Connect, which provides support for selected fifth graders to foster the development of life skills needed to solve problems and improve academic performance. Each week, I come prepared with individual activities centered around the goals that each child creates. In my bag, you’ll find candy, watercolors, inspirational stories about kids who do amazing things, goal sheets, handmade stress balls, and, for my last session, a stomp rocket (because the harder you try, the farther you’ll go!). This mentorship approach thrives on building a trusting relationship with the students who have been referred to the program. I communicate regularly with the students’ parents about goals and progress, and I also connect with the teachers, helping to build constructive family-school relationships. These kids are amazing, and their resilience inspires me. Recently, one of my students told me that Tuesday was her favorite day of school because she got to see me. The reward of work like this is off the charts. It’s a joy to love these kids each week and to provide them with nurturing confidence. Some people live in money. Some people have to ask for money. Some people have jobs to get money. Some people can’t get jobs to get money. Some people live in big houses. Some people live in boxes. Some people have these fancy cars. Some people have to walk. Help people out. Be there for people. If only we adults had half the vulnerability of this fifth grader. She talked about how, even though she wasn’t sure she’d done the assignment right, she had felt compelled to read the poem out loud to her class. 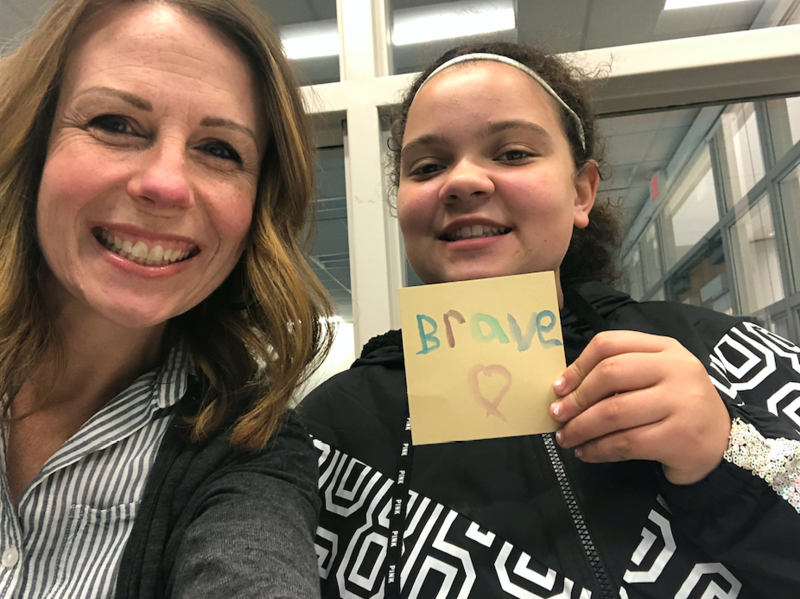 This particular child was working on finding her voice and growing in self-confidence, so this was a huge victory for her. She was so proud of what she had to say. I asked for a copy of the poem because I wanted to share it with my own kids at home. One thing I couldn’t get away from in hearing the words and reading them several times: money. It either gives us what we want in life, or keeps us from it. Right? At least that’s the perspective that a lot of us have. But does money have to be what divides us, or does this child offer a simple takeaway that changes everything? We tend to go all or nothing. Never enough or… well, is it ever enough? And what if you’re somewhere in between? As I engage with this poem, it makes me think about my own life situation. We don’t live in a box, but we are renting a small house for our family of six . We don’t have fancy cars, but we do have cars. We have jobs, but sometimes we still don’t have money. We’ve had to ask for money before. We’ve also given money away. We’ve been on food stamps. We’ve also volunteered at food banks and fed the poor. Money can’t buy happiness—we all know that—but it’s stressful when you don’t have what you need to make ends meet. Poverty isn’t the way it’s supposed to be, but living in the cycle of “more, more, more” doesn’t satisfy either. At least this child was brave enough to talk about the gap. It makes me think that we all have something to bring one other, and that empathy and compassion go a long way. And even though we’re told that comparing ourselves with others is never a good thing, sometimes it can make us aware of gaps that we're otherwise blind to see. While I complain at times about living in a rental home, I can’t say that I’m always aware of people living in boxes. Gratitude—it gets me every time. And awareness that I have something to give, even it’s my time, my love, or just to listen. And that I have something to learn from everyone. From the perspective of a child, you never know what someone is going through. Jen Patterson works part time as an Academic Coach and is a wife and mother of four. She is a hope dealer and a funster (someone who seeks out fun in all situations and makes it happen) with a love for God who looks for beauty and goodness in the world. She leads art workshops for kids out of home in Free Union, Virginia, and values living out of her heart, vulnerability, and stories around a table.